Notepad: A More Effective Decision-Making Framework: Cynefin, A Domain Driven One! A More Effective Decision-Making Framework: Cynefin, A Domain Driven One! Let me introduce you to the Cynefin framework. If you are having a hard time pronouncing it, you are not alone. It is Welsh and is pronounced as /kun-ev-in/. It is a decision-making framework. Cynefin helps you to make better decisions based on the domain you are in. Let me start by talking about four major categories, one minor common area and one dangerous edge in Cynefin framework. 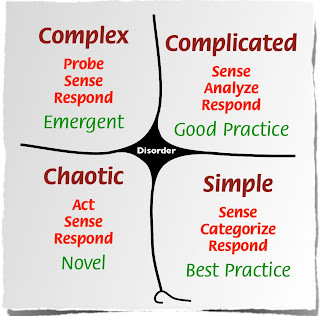 The Cynefin framework categorizes domains into Simple, Complicated, Complex, Chaotic and Disorder ones. Simple domain is an ordered domain. In this domain, relationships between cause and effect exist and are clearly visible and self-evident, they are predictable to the observer. In this domain, best practices are applied. The model for making a decision in this domain is Sense-Categorize-Respond. An example of this domain will be a bank representative calculating interest for an account based on a predefined formula. Complicated domain is an ordered domain similar to the Simple domain. Domains on the right of Figure 1 - Cynefin Framework are ordered domain. In this domain, there is a relationship between cause and effect. However, as it sounds the relationship is complicated. There are right answers but answers are not self-evident. In this domain, you need to seek expertise knowledge to help with. The experts help you with making correct calls and finding a good practice that works for you. The decision model in this domain is Sense-Analyze-Response. Beware that Best practices in this domain won’t work and usually will upset people. There is no silver bullet way of doing things in this domain. There can be several different ways of doing things in this domain with the right expertise. Have you ever seen your friend’s status on a social media as complicated? That speaks to this domain. There are relationships available but they are complicated! Another good example of a Complicated domain is technical mastery in software development. Complex domain is not an ordered domain (All domains on the left side of Figure 1 - Cynefin Framework are unordered domains). In this domain, there is no causality link visible nor available. The relationship between cause and effect can only be perceived in retrospect and the results are unpredictable. In this domain, we want to create safe to fail experiments and not attempt to create a fail-safe design. There are no good or best practices applicable in this domain. The practices are novel practices that are developed from within the system, usually as a result of safe to fail experiments. After running the experiments, we need to dampen the parts that fail and amplify the parts that succeed. This is the domain that emergent orders come into life. The decision model for this domain is Probe-Sense-Response. A great example of this domain is human interactions in a team. You can think of a team that you were part of in the past. How could one get to a specific goal in this domain? The domain is complex to deal with and there are emergent practices that are being arisen from within in this domain. Obviously and as its name suggests this domain in an unordered domain. There is turmoil here. 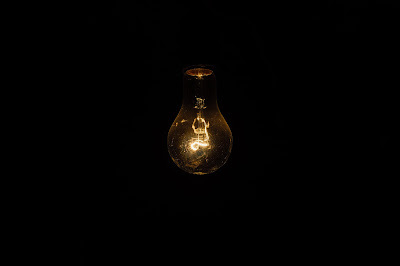 If you are in this domain deliberately, you are there to innovate. If you are there by accident, you need to stabilize it as fast as possible. The decision model is Act-Sense-Response. Any practice in this domain is a novel practice. In this domain, you need to think differently. A great example of this domain is within innovation sphere. 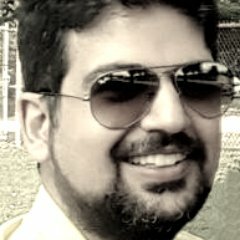 You can think of the Blockchain concept in the banking domain. Another good example of Chaotic domain are the industry disruptors, such as Airbnb. This is when you don’t know which domain you are in and you are interpreting on the wrong basis. You are applying best practices to a domain that is chaotic or good practices for a simple domain. You need to figure out which domain you are in immediately. The edges between all the domains are for transitions with one exception, the one between Simple and Chaotic domain. The danger in the Simple domain is that you start to believe things are simple, the system is simple. You start to believe the past success means success in the future. These will lead you to move to the complacent zone, the area close by where the Simple and Chaotic domain meet (i.e. the Dangerous Edge). In the complacent zone, it only takes a crisis to move yourself into the Chaotic domain from the Simple one. In this case, the recovery is very expensive. Staying in a Simple domain and not becoming complacent is not the solution nor it is viable. You want and need to manage to be in the Complex or Complicated domain and a very small amount of material in the Simple domain, the reason being it’s high vulnerability to the rapid and accelerated change. 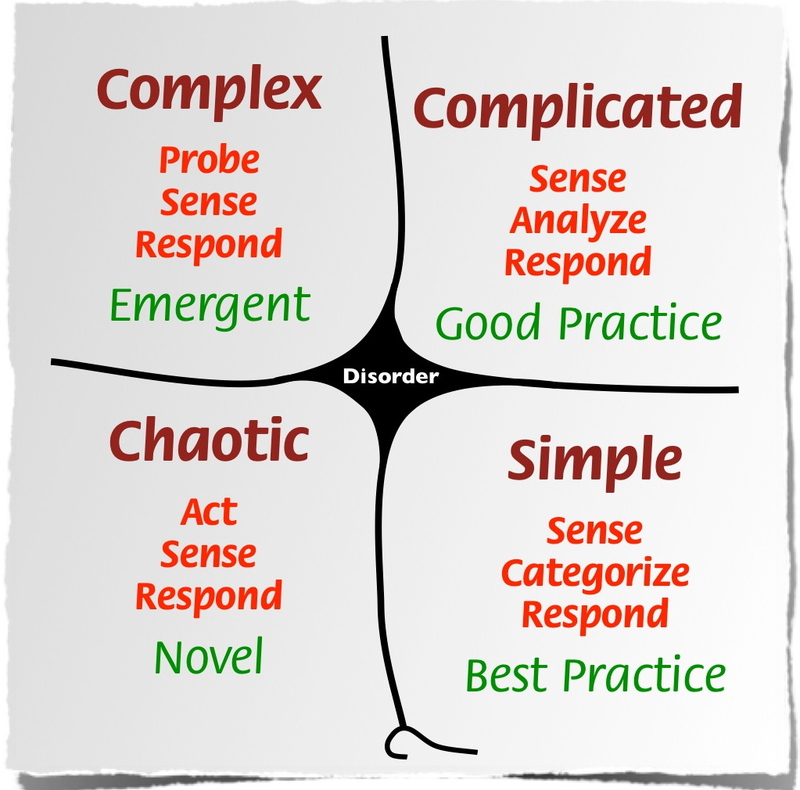 How to Make Use of Cynefin? Cynefin is a framework. It can be used on a daily basis on any domain that you are part of or dealing with. You can always ask the question which domain are we dealing with and for the least, which decision-making model is best applies to it. Sometimes, you would find yourself doing a task for a long time and develop a sense of best practices. You, unintentionally and out of habit, try to apply the same practices in another domain without even questioning it. In the new domain, you might be in dealing with a complicated domain which needs you to reach out for expertise and find out good practices instead of insisting on using best practices and applying them. What you can do is to try to learn more about Cynefin and the domain you are in. You can then, based on the analysis, use the decision-making model suggested for the domain you are in. You want for sure to avoid the Dangerous Edge. Are there any obvious ones in your domain? You can also run your findings with a colleague to re-affirm your observations. The next step would be to think about your next strategic and tactical moves and/or actions. It is not going to be easy, at all. It needs deliberate practice and self-awareness. It needs questioning, to be curious, seeking guidance and to have a growth mentality. You can download this article in a PDF format, as well embedded below. You can also take a look at My notes on Cynefin.